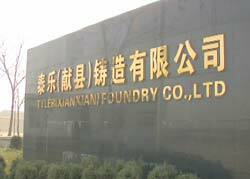 McWane's Tyler Xian Xian Foundry, Hebei Province, China. U.S. pipe manufacturers are facing increased competition from China, especially when it comes to producing the fittings used to connect large underground water pipes. Manufacturing the fittings is expensive, and China's cheap labor gives companies there a great competitive advantage. By 2003, the largest makers of these fittings in the United States had moved their operations to other countries, or simply imported the product -- except for McWane. In fact, just before the New York Times series and the original FRONTLINE broadcast in 2003, McWane President Ruffner Page wrote to the Times expressing serious reservations about doing business with countries like China, saying they had "little or no regard for the safety of their workers or concern about polluting the environment." Worker painting a pipe fitting at McWane's Tyler Xian Xian Foundry. McWane was also concerned about unfair competition from less expensive pipes flooding the U.S. market. In an attempt to protect its market position, in September 2003 McWane filed a petition with the U.S. International Trade Commission (ITC) asking for a limit on imports of certain pipe fittings from China. McWane's competitors vehemently opposed the petition, as the sanctions would mean tariffs on the pipes they were importing. The commission sided with McWane, but the petition also required the approval of the White House, and President George W. Bush sided with McWane's competitors. Ruffner Page says the decision left the company with little choice. "We were either going to have to build a plant in China, outsource our operation or leave the business," he wrote in an e-mail to FRONTLINE. Page says he and his executives toured India and China looking for an alternative source of supply. They settled on China, where they felt they could maintain higher standards. 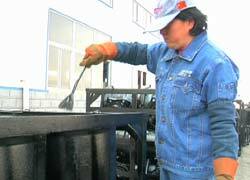 The company built its own plant in China's Hebei Province; McWane's Tyler Xian Xian has been in operation since 2005. The China plant did result in McWane's closing of its pipe-fitting plant in Tyler, Texas, which was part of the Tyler Pipe group of foundries. In 2005, more than 200 workers were laid off in Texas. Nearly 800 Chinese workers would eventually be hired to staff McWane's plant in China. McWane says that safety standards at the plant exceed Chinese regulations and that injury reports are sent directly to McWane headquarters in Birmingham, Ala. The company was named the "Excellent Environmental Protection Facility of 2006" by the Cangzhou Environmental Protection Bureau.